Wall Street held a post-midterm election rally on Wednesday with the Dow (DJIA) and S&P 500 (SPX) rallying just over 2.10% each. 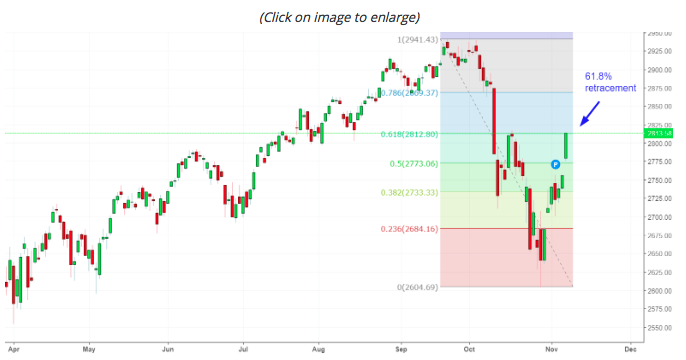 The strength in the two indexes was only dwarfed by the tech-heavy Nasdaq (NDX), which rallied over 2.6% on the trading day. As we suggested previously at Finom Group, should the market’s rally after the midterm elections were completed, it is likely the due to the removal of an uncertainty, something investors don’t take too kindly. With midterms now out of the way and a split government cemented until the next election cycle, investors will turn their focus toward the FOMC meeting and statement on Thursday. Prior to outlining the expectations of today’s FOMC statement and key factors, let’s quickly revisit what investors have relied upon for market return expectations after midterm elections. It’s been well published and numerously that markets tend to rally after midterm elections and are higher over the next 12-month period, but there is at least one factor that lends itself to this precedence that is absent in this election cycle. 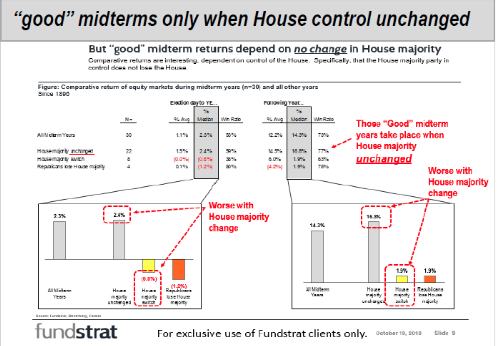 The data compiled by Fundstrat Global Advisors showed that post-midterm rallies hinge on the majority party maintaining control of the House. That’s not what happened this time around as the House flipped to the Democrat side. Fundstrat Global Advisors showed the median stock market return since 1896 was only 1.9% a year after the House majority flipped from one party to the other. Meanwhile, the median return totaled 16.8% when the House majority stayed the same after the midterms. That’s a very big divergence. With regards to what will happen post the midterm election cycle, here is what Nobel Prize-winning economist Robert Shiller says. “This election will be different as it is more of a referendum on President Donald Trump, adding he would not use this election to predict which way the market will go. 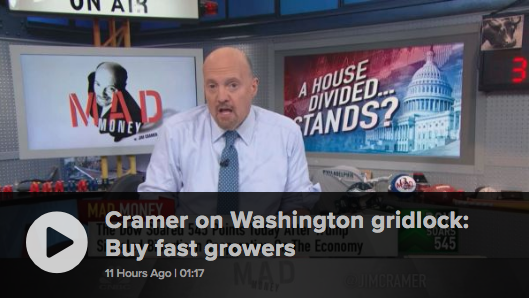 CNBC’s Jim Cramer suggests that the newly installed gridlock in Washington could cause an economic slowdown, but expects Washington to bring opportunity to stock pickers. 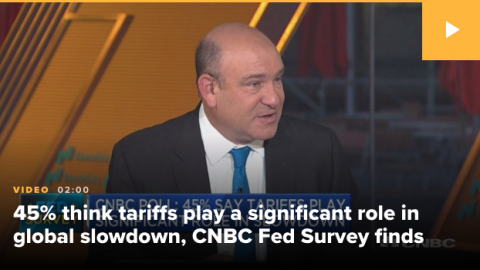 Here is additional commentary from Cramer’s recent Mad Money airing where he suggests a slowdown in the U.S. economy. “There’s very little chance that Washington legislators will get a second tax cut or an infrastructure bill, or anything that could give us a “boost” given that newly empowered House Democrats may not want to give the president what he wants ahead of 2020. All eyes and ears will be widened and tuned to what’s highlighted in the Fed Statement when it is released at 2:00 p.m. EST on Thursday. While no rate hike is set to occur during this 2-day meeting, the statement will be of key relevance. Economic data continues to support the Fed’s current rate path as wages are rising, the labor market has tightened and consumption is trending higher. But as certain segments of the economy are strengthening, others are showing signs of stress, including the Housing sector. Higher rates have put a dent in the housing sector. Since January, when the total of new privately owned housing units started hit an 11-year high of 1,334,000 units (annualized), housing starts have fallen to 1.2 million annually in September, according to the U.S. Bureau of the Census. That’s a 10% decline and nearly a three-year low. Given the downturn in the housing sector and jump in rates since January mortgage applications have also come under pressure. Total mortgage application volume fell 4% last week from a week earlier and plunged 16% from a year ago, according to the Mortgage Bankers Association’s seasonally adjusted index. Mortgage applications to purchase a home led the volume lower, falling 5% for the week to the lowest level in two years. Purchase applications were 0.2% lower than a year ago. So what are we getting at with this weakening narrative of the housing market and how does it tie in with the FOMC. Simply put, the housing market has an amplifier affect on the economy. You buy a home and you buy stuff to put in that home. With some 70% of the U.S. economy being consumer driven, the more homes sold the better the consumer spending data and the overall economic data. Again, the housing market is an amplifier of what the economy is doing on the whole. Many desire the FOMC to recognize that the weakening housing market/industry may be a harbinger of a looming downturn in the economy, as it was in the more recent Great Financial Crisis. With higher rates keeping first-time buyers on the sidelines and median home price values showing signs of plateauing, economists and investors alike are hopeful the FOMC finds the data meaningful enough to evoke a pause in rate hikes after the December hike that is pretty much a foregone conclusion. 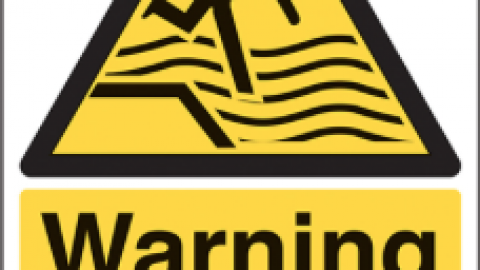 The media pundits and permabears have been pumping life into the notion or theory that the housing market decline since January is an omen, a recessionary indicator. Historically they may be right. Of the 11 recessions since World War II, nine have been preceded by “substantial problems in housing and consumer durables. That’s a good percentage, but it’s clearly imperfect and not 100% indication of what’s to come. Ed Leamer, an economist at UCLA Anderson, who published a notable paper on housing in the summer of 2007, offered a more factual representation of housing-led recessions and the current state of the housing market. “Based on historical standards, we’re still at levels that are sustainable. I could see 1.2 million being a ‘new normal’ based on the aging of the U.S. population.” Slower population growth creates less demand for new housing units. If you look back to 1994 or so, you’ll see a period of time where it was pretty flat around 1.4 million units, up and down a little bit, but it was sustained for a long period of time at that level. If it got over 1.4 [million annually] you’ve got to start worrying about it” because it would be a sign of too much froth. What we can extrapolate from Leamer’s statements is that we are still a long way off from housing starts falling into economic recession indication territory. Additionally, if you are an investor in real estate, the easy gains have been made and home price appreciation for the likes that we’ve seen since 2010 may be a thing of the past. 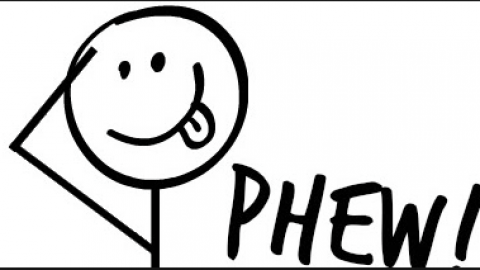 And when it comes to the probability of a pause in rate hikes: If we take Leamer’s highly educated offering, the probability of any material change in the Fed’s rate hike path may not be altogether high presently. Having said that, President Trump’s recent commentary about the Fed coupled with the recent 10% market correction may find pull at the Fed’s “heart strings”. It’s really anybody’s guess, but anticipation remains front of mind with investors. 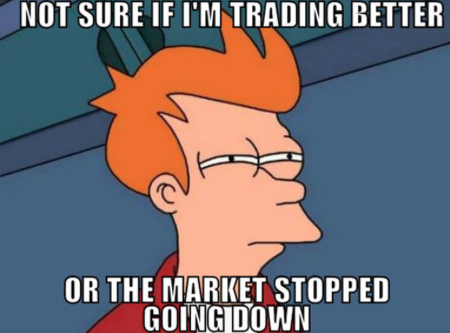 Moreover, the market has clearly found difficulties adjusting to the new normal. The new normal is higher rates and a Fed tightening cycle. Many investors have never experienced a Fed tightening cycle. Under this premise, Deutsche Bank Chief U.S. Equity Strategist David Bianco says, “Don’t fear interest rate normalization.” That’s the title of one of his recent research notes, which takes a deep dive into what happened to markets each of the 15 times the Fed has embarked on policy tightening since 1965. With the rally off the October lows, highlighted by a greater than 2% rally after the midterms, investors may not want to lose sight of the many variables that have contributed to this bull market cycle. The economic data remains strong on the whole and leading indicators suggest the economy will remain in expansion territory through much, if not all of 2019. What may prove “different this time” is how the market treats economic data. We’ve already seen in 2018 that good data is not always received well by investors at first, as it suggest further rate hikes are in the cards. 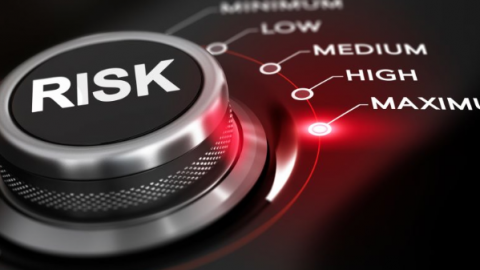 Investors naturally fear rate hikes and rebalance their portfolios along the lines of risk premium. Earnings growth and corporate buybacks have accelerated and proven to backstop markets when entering correction territory for each correction in 2018, but what this underscores is market multiple compression and heightened levels of market volatility. In short, the road during a Fed tightening cycle doesn’t forecast a bear market is looming, but it does forecast a rockier road ahead for investors, even if markets achieve new record levels. 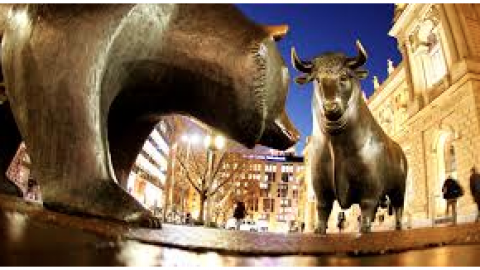 Finom Group remains of the opinion that new market highs will be achieved before the onset of a bear market. At present, the S&P has made a 61.8% retracement of its current correction period. Given the retracement depicted in the chart above and the S&P 500 blowing past the weekly expected move of $65 already, a short duration pullback in the market may present itself before a commencement of a Santa Clause rally. Then again it may not, which is why Finom Group is maintaining its current positions and looking for trading opportunities. While the FOMC may prove to be “king for a day or two”, earnings rule the roost long-term. Equity Markets Take on The 3% Bond Yield Challenge: Who Wins? 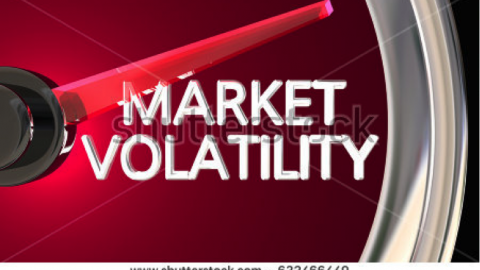 Equity Markets Breathe a Sigh of Relief After Midterm Election ResultsAre Equities Preparing to Walk Back Recent Gains? Great article, Seth – as always. One item of import, in my opinion, which has only been referenced minimally by the Fed, is the continued reduction of assets on the Fed Balance Sheet. This, of course, is the net selling of bonds after the Fed brought an end to QE, or Quantitative Easing, which has had the net effect of a market-based rise in interest rates as bond prices have fallen. Not to mention a flattening of the yield curve. 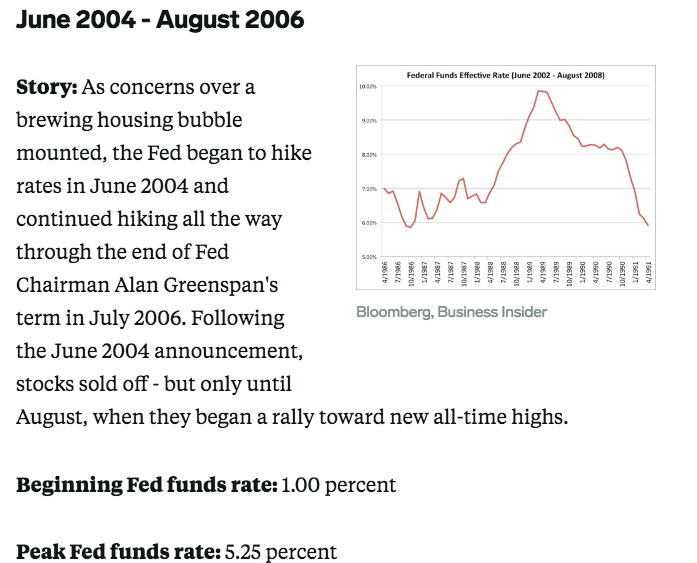 This ongoing, behind-the-scenes asset selling, coupled with the overt raising of interest rates by the Fed, has been instrumental in contributing to the housing slow-down and the October 2018 stock market correction. 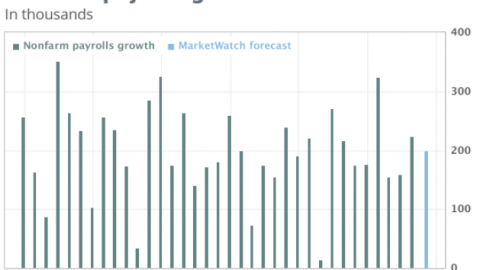 It also bears mentioning that seasonal dynamics are playing a role in the housing slow-down. In the current environment, there is a contingent of market participants who are in favor of letting the market resolve the interest rate equation, without the accelerated effect of the Fed raising rates 3-4 times over the next 12 months. They contend that the market is smarter than the Fed and that the inexorable reduction of the Fed’s Balance Sheet will be enough of an impetus for interest rates to properly manage the current economic growth. 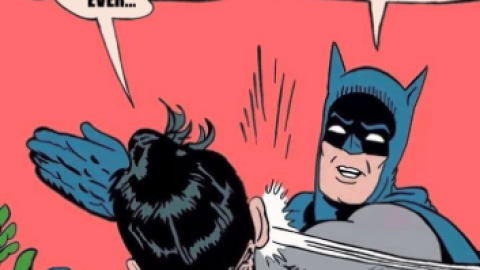 Preemptive strikes have merit… sometimes. However, the Fed has now seen what initiating a preemptive interest rate strike… er, hike, can do to the market. Maybe it will become more flexible in its stated number and frequency of hikes as the end of year approaches. We can only wait and see… and hope.